The exhibition Inside Out: Pompeian Interiors Exposed at the Italian Cultural Institute includes a virtual-reality model of the Villa dei Papiri (Villa of the Papyri) in Herculaneum that I recently developed at UCLA’s Experiential Technologies Center with support from the Friends of Herculaneum Society. 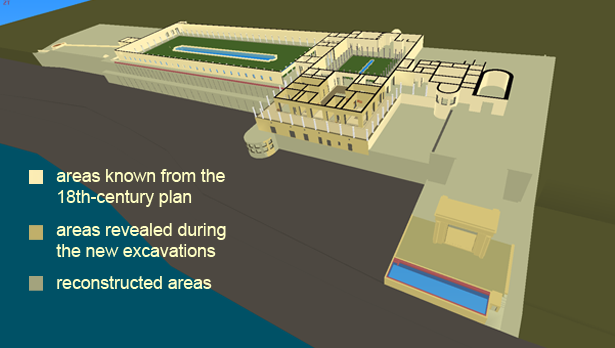 The model presents a digital walkthrough of the grand ancient villa, which was located by the sea and decorated throughout with mosaics and frescoes. Named after the collection of papyrus scrolls found on its premises, the Villa dei Papiri is famous for inspiring the design for the Getty Villa, though the Getty Villa’s groundplan is adapted to its narrow canyon site. 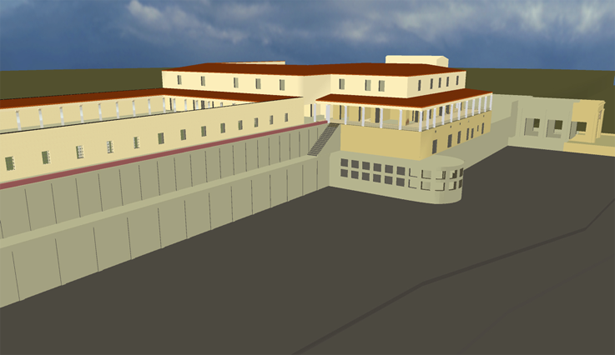 Still from the virtual-reality model of the ancient Roman villa known as the Villa of the Papyri for the many papyri scrolls unearthed there. A grand peristyle garden (porticoed garden) extends at left. The VR model incorporates data from both past and recent excavations and proposes a scientifically documented reconstruction, as opposed to commercial reconstructions that are influenced by the Getty Villa. I developed the model in discussion with the excavators of the site with the purpose of making it available as a research tool for archaeological excavation. The Villa dei Papiri is located below ground level under layers of rock, and still has not been entirely excavated. My aim in creating the virtual-reality model of the Villa of the Papyri was threefold. First, I set out to create a digital architectural model that incorporates the architectural structures known from the 18th century as well as those found in recent excavations. Second, I wanted to present a reconstruction that distinguishes the structures known from Karl Weber’s groundplan made in 1758, when the villa still lay mostly underground, from the structures that have been unearthed in excavations conducted between 1986 and 1998, and again since 1999, as well as from proposed restorations. These areas are color-coded on the model: beige for areas known from the 18th century plan, gold for areas revealed during the recent excavations, and grey for reconstructed areas. My third aim in creating the VR model was to reincorporate the surviving known fragments of the finds from the villa, such as wall paintings, mosaics, sculptures, and papyri. 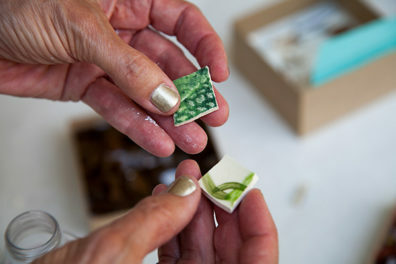 In the model, visitors can see images of these artworks, which dot the site as shown in the diagrams below. Locations of ancient Roman wall paintings (frescoes) found at the Villa dei Papiri, and included in the VR model. Red arrows indicate 18th-century finds, blue arrows indicate finds from recent excavations. Locations of ancient Roman mosaics found at the Villa dei Papiri, and included in the VR model. Red arrows indicate 18th-century finds, blue arrows indicate finds from recent excavations. Reinhard Förtsch and I are currently working together to publish the model online through the websites of the Archaeological Institute at the University of Cologne and the German Archaeological Institute, with the support of the Thyssen Foundation, so that people around the world can pay a virtual visit to this striking Roman villa. All Images © 2012 Mantha Zarmakoupi. 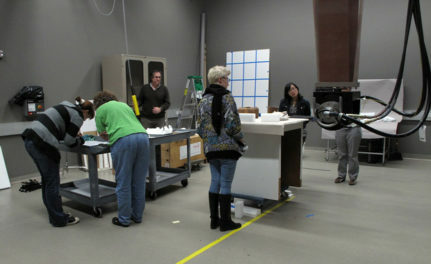 Modeling undertaken at the Experiential Technologies Center, University of California, Los Angeles. 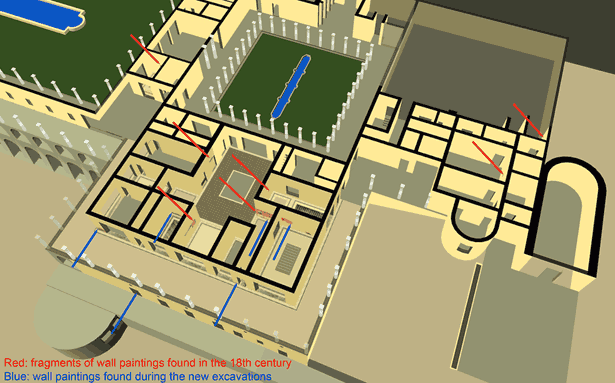 The virtual reality model of the Villa dei Papiri was created at the Experiential Technologies Center, University of California, Los Angeles, with the support of the Friends of Herculaneum Society, University College London, and the Excellence Cluster Topoi (Freie Universität, Berlin). Special thanks to Diane Favro, Lisa Snyder, Chris Johanson, and Dean Abernathy. Text of this post © Mantha Zarmakoupi. All rights reserved. I’m a senior fellow at the Getty Research Institute working on a book project on the idea of landscape in Roman luxury villas. I’m also an associate of the École française d’Athènes, participating in a research team that examines the storage spaces in the late Hellenistic city of Delos. I earned my PhD from Oxford and have held research fellowships at the Freie Universität in Berlin, New York University, and the University of Cologne, and have taught at Bard College in Berlin and University College London. In 2010 I edited a volume on the Villa of the Papyri; my first monograph examined the architecture of Roman luxury villas around the Bay of Naples.